Learn the fundamental steps necessary to launch an officially and legally incorporated business, start collecting sales tax, and bank your profits as a legitimate merchant. There is plenty of talk about pulling yourself up by the bootstraps, the Land of Opportunity, and the American Dream. Kids all want to be entrepreneurs, just like their Hip Hop music idols. But there are some basic rules to the game, and if you don’t know them then you’re going to spend your life on the bench as a bystander. A surprising number of people leave college with no concept of financial literacy, and a disturbingly large segment of the population has no clue about what it actually takes to launch a business. But I believe in the value of continuing education. Even if you know nothing about how to manage money, start a business, or save for retirement you can just do your homework right here on this website and I guarantee you’ll learn plenty. That’s because I learned most of my financial and business lessons the hard way, in the school of life, where you get taught stuff they never even mention in the classroom. Today we’ll talk about things that you need to know to launch a business. The mechanics of opening a business don’t necessarily involve writing up a fancy business plan and convincing your banker that you have what it takes to succeed. That’s great, and I encourage you to come up with an articulate plan. But plenty of people have earned millions of dollars with an idea and a business that they started without any help, on a shoestring budget, with no real assets. That’s especially true if you launch an online business because the overhead is low and the potential to gain customers is practically unlimited. But there are some nuts and bolts you really cannot avoid if you want to get into business the right way and continue without obstacles. You need to have an official business. In most cases people have what is called a Sole Proprietorship, which means they just run the business in their own name. What they earn is taxed as their own personal money by the IRS. If you plan to process online payments, that typically involves setting up some kind of system to accept credit cards or at least a PayPal account. If you want to buy from wholesalers, they’ll expect you to give them your tax number. That means you have to set up a commercial business account with a bank and register your business with the Clerk of Court or perhaps also the Secretary of State where you live. 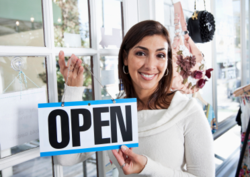 If you want to shield yourself from business liability – like if your business goes bankrupt but you don’t want creditors to come after your personal assets – you’ll likewise need to set up a business corporation. You’ll also want to incorporate if you are going to have full time employees or want to take advantage of the best tax perks. There are lots of different kinds, including both for-profit and nonprofit corporations. Some give you simple legal protections, and others offer greater protection from financial liability while they have more complicated tax rules to follow. Research the different kinds of corporate entities and then choose the one that works best for you and your needs. After incorporating you’ll need to be able to cash checks people give your corporation, which requires a business bank account. Before going to the bank to do that, though, you first need to register a DBA, which stands for “doing business as.” In other words, if your dog biscuit company is named Fido Treats then you are “doing business as Fido Treats.” Without registering a DBA in your home county or state you won’t be allowed by your local banker or a major credit card payment processing company to open a business account. Someone hands you a fat check when they buy your dog biscuits. The check is made out to Fido Treats. You need a bank account named Fido Treats. Otherwise you cannot cash it. So you get a registered DBA and show the registration documents to your banker – who will then agree to open an account in your corporate name. But the government also wants a piece of the financial action. So in most cases you are required by law to charge sales tax, and to do that you have to go to your state tax office and open a sales tax account as a merchant. They’ll require you to register and every month or so you’ll have to submit a tax form showing your sales revenue and how much sales tax you collected – which you have to turn it to the tax authorities. Screw that up and they will call your bank and freeze your accounts. Then they’ll send a guy to your door to repossess your office equipment, vehicle, or house. If you sell something that could hurt someone you better also get some liability insurance. Think of it this way. Are you doing anything in your business that could make somebody want to sue you? If all you do is something like selling downloads of your songs posted on iTunes or working as a clerk in a clothing store – then forget insurance. But if you fix the brakes on people’s trucks, you work as a babysitter, you write a blog where you dish out medical advice to your readers, or you run a company that sells dog food, things can go wrong. You better get covered or you and your enterprise might get wiped out trying to fend off a hotshot lawyer. About: BeggingToRetire is an opinion website geared toward offering people tips, strategies and offers to achieve stronger financial freedom.